The Community Clinical Experience course spans the first two years of the College of Medicine - Phoenix curriculum, and is characterized by an ambulatory care preceptor hosting a student in his or her office one afternoon, generally every other week. This schedule alternates with the Doctoring course and, when possible, the curricula are integrated with each other. 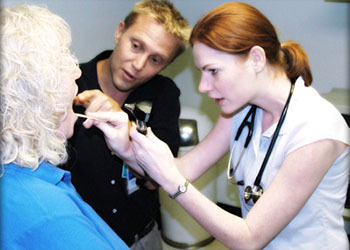 The fall of the student's first year incorporates sessions primarily designed to promote clinic readiness and includes opportunities for the student to meet with their preceptor to set expectations and to work with both front office and back office personnel in their assigned clinic. Beginning second semester first year, the student is embedded in the preceptor's practice, assuming graduated responsibilities over two years and learning all facets of the practice. This includes: opportunities to further develop interviews, physical examinations, presentation and documentation skills learned in the Doctoring course and applying concepts learned elsewhere in the curriculum to real medical practice. The Second semester of second-year is designed to give the student an opportunity to meet in small groups to discuss their course experiences and to present, discuss and be assessed on a presentation of a patient seen during the course. Identify financial and structural aspects of the health care system experienced by patients. Apply the knowledge and skills learned in Year 1 to patient care. In collaboration with a preceptor, discuss the medical care needed to treat illnesses and maintain optimal health of patients, including preventative health guidelines. Describe how physicians relate to payers, pharmacies, laboratories, other physicians and members of the health care team. Describe the importance of documentation and demonstrate the ability to document medical encounters. Access evidence-based information quickly and apply to patient complaints and illnesses. Demonstrate professional behavior in clinical, academic and community settings; including teachable attitude, giving and receiving constructive feedback, being present and accountable, prepared and engaged.